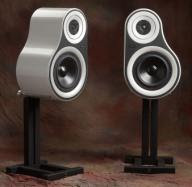 Salagar Sonic, makers of high end loudspeaker systems revealed their Salagar Symphony S210 which the company claims produces full rich sounds. Salagar Sonic stated that the Symphony S210 emulates the shape of the string instrument family---it just looks like a pair of kidney to me. design facilitates an even distribution of cabinet stress, realized by creating a curved walled, airtight vessel, to reduce dramatically cabinet coloration for high quality sound production across all audible frequencies."